When you are selling Good Til Cancelled listing on eBay, keeping your selling history intact is very important. This history will give your listing priority when buyers are searching through eBay. 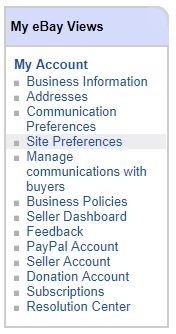 Within your eBay account, hover over your name in the upper left hand corner and then select "Account Settings". From there you should see a "My eBay Views" section along with a few options including "Site Preferences". On this page you will see "Use the out-of-stock-option" and you will want to make sure that this is checked. With this enabled your listing history will be intact and will become re-activated once you purchase more stock.